PATTERN PLAY WITH PENS by Joni Feddersen .....South Carolina's first Certified Zentangle Teacher. White on Black...oh my. This is a challenge. I reached for some clay board I'd been saving to try out some tangles on, and this seemed like the appropriate time to do it. 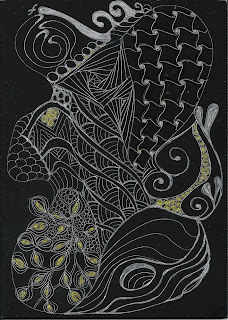 Well, it's not any where near as easy to work with as good ole black ink on white Zentangle tiles. There was a cool feeling as the stylus sank into the clay and started to make a mark, but it did have a mind of it's own. This doesn't look very Morris, but it was fun to give it a try. I added a little "bling" with silver and gold gel pens. I'll have to have another go at this one. Very nice! I love the touch of gold. Beautiful! I can't wait to try this! Beautiful! I don't know anything about clay board ,but you made it work. Looks like drawing on slate. The section in the lower right is attracting me – looks as if there is a tunnel to a secret place ;-) . • Increasing sense of personal well being. 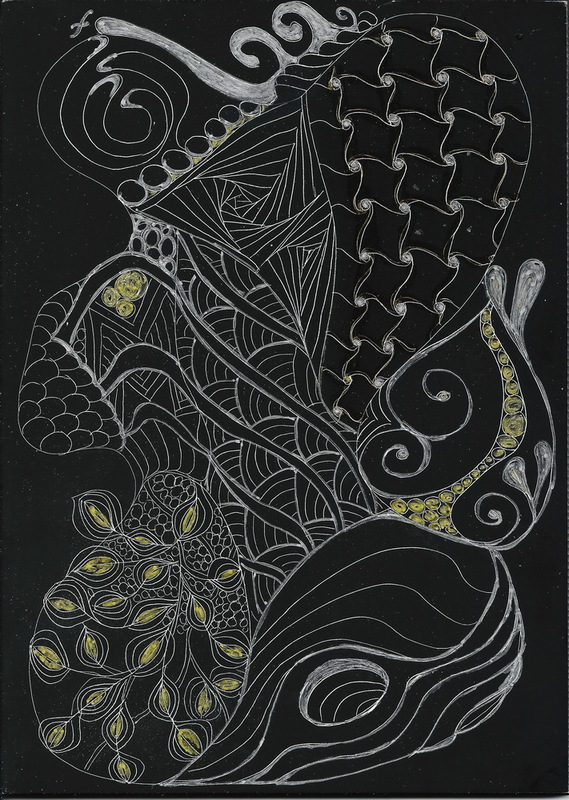 Zentangle is enjoyed by a wide range of skills and ages. Love to do zentangles, they relax me, and open my imagination to new possibilities.